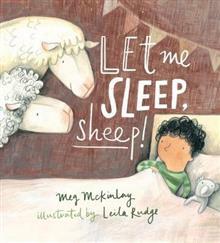 A hilarious picture book from award-winning picture book duo Meg McKinlay and Leila Rudge. When Amos starts counting sheep, there's one thing he doesn't quite count on ... How's he supposed to sleep when the sheep land - THUD! THUD! - in his bedroom?This zany tale of bedtime shen... read full description below. A hilarious picture book from award-winning picture book duo Meg McKinlay and Leila Rudge. When Amos starts counting sheep, there's one thing he doesn't quite count on ... How's he supposed to sleep when the sheep land - THUD! THUD! - in his bedroom? This zany tale of bedtime shenanigans is the new picture book from the award-winning duo behind No Bears and Once Upon A Small Rhinoceros. Meg McKinlay is an award-winning author of picture books and children's fiction. She lives with her family near the ocean in Fremantle, Western Australia. Her most recent novel, A Single Stone, won the Prime Minister's Literary Award, the Aurealis Award and the Queensland Literary Award, and was short-listed for the Victorian Premier's Literary Award, the NSW Premier's Literary Award, the Western Australian Premier's Book Award and the Children's Book Council Book of the Year Award. www.megmckinlay.com Leila Rudge was born in England. She moved to Australia after completing an Illustration Degree at Bath Spa University. Creating tiny characters for books is her favourite part of illustrating. In 2012, her book No Bears(written by Meg McKinlay) was short-listed for the CBCA Picture Book of the Year award in both the Picture Book and Early Childhood categories. Her first picture book as both author and illustrator, Ted, was a CBCA Notable Book. In 2017 her second book as author-illustrator, Gary, was short-listed for the CBCA awards.